Before describing the signs and symptoms of spinal tumours, it must be made clear that a very small percentage of back pain is caused by any type of tumour, but if pain is present for more than 3 months, medical advice should be sought in order to rule out a tumour. Almost all spinal tumours have one particular common denominator; pain. In fact 80% of spinal tumours result in pain, though the degree and rate of onset is dependent on the size, location and type of tumour. It should also be noted that any tumour that is around the spaces between the vertebrae, or indeed on the inside of the vertebrae, will normally have the consequence of spinal cord compression which itself carries a variety of common symptoms dependent on the size and type of tumour. These indications are weakness in the back and limbs which can vary in severity; a feeling of the legs ‘giving-way’; pins and needles and even numbness or paralysis of the limbs and torso. Aneurysmal Bone Cyst: Causes of ABC’s could be a trauma to the bone, including fractures which may also be a consequence of an untreated growing cyst that weakens the bone. An ABC can arise as an effect of other tumours such as an osteosarcoma or chondrosarcoma. These cysts are usually found in the knee area, but can present anywhere in the skeleton. Symptoms include a rapid onset of acute pain which increases in severity over a 2-3 month period; a localised increase in skin temperature, swelling of the affected area and occasionally headaches if in the neck or skull. Giant Cell Tumour: One of the most common types of tumour in young adults, this tumour presents itself with a slow but progressive sort of pain that will increase with the growth of the tumour, and may be partnered with or without a palpable mass. If the mass is in close proximity to a joint, a reduction in movement of that joint with accompanying pain on movement is likely, as is fluid accumulation and tenderness around the joint area. (There is a small possibility that it may become malignant over time if left untreated). Hemanginoma: This is an extremely common type of tumour, likened to an internal birth-mark by many physicians. If it is large, there is a possibility of it bleeding which could leak into the spinal canal causing pain due to the lack of space to accommodate the extra fluid. It is usually regarded as a non-problematic tumour that is most often without symptoms. Osteoid Osteoma: Presenting with a dull ache that worsens during the night, the pain caused by an osteoid osteoma can usually be managed with anti-inflammatory pain killers. There may be heightened pain if the tumour is near to a joint accompanied by tenderness and swelling. If an osteoid osteoma is found in the epiphysis of the bone, a growth defect can occur. Chordoma: Normally occurring in the spine or the base of the skull, this tumour has a slow growth rate and pain levels vary on the location. Tumours at the very top of the spine/base of the skull can cause headaches and visual disturbances. Also dependant on the location are the possibilities of suffering with spinal cord compression, and if in the sacral region, a noticeable mass and the chance of having bowel and bladder problems. Osteosarcoma: very rare in the spine, an osteosarcoma will usually be found in long bones where pain around the tumour site is likely. 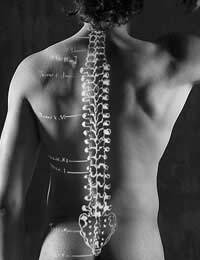 If however it is present in the spinal bones, symptoms include loss of height, the possibility of fractures (due to pressure from the growing mass), and neurological deficits such as weakness or a loss of sensation. Chondrosarcoma: Causing pain around the site of the mass, a chondrosarcoma can produce abnormal reflexes in movement, occasional numbness and limb weakness. Plasmacytoma: Due to a growth in plasma cells, resulting in the lowered production of red and white blood cells, symptoms can include anaemia and an increase in the susceptibility to infections. Multiple Myeloma: Any increase in activity can produce a heightened sensation of pain, but if pain becomes persistent, it may be an indication of a bone fracture. Lymphoma: Resulting mainly in spinal cord compression, lymphomas can cause pain in the lower back and neurological problems in the lower limbs, such as a change in reflexes. Ewing’s Sarcoma: Symptoms present as a change or loss in bowel and bladder function, decrease in appetite, loss of weight, tingling, numbness or sometimes paralysis. The GP, Practice Nurse and Oncologist will decide together with the affected patient, which form of treatment is the most appropriate and effective for the type of tumour diagnosed.